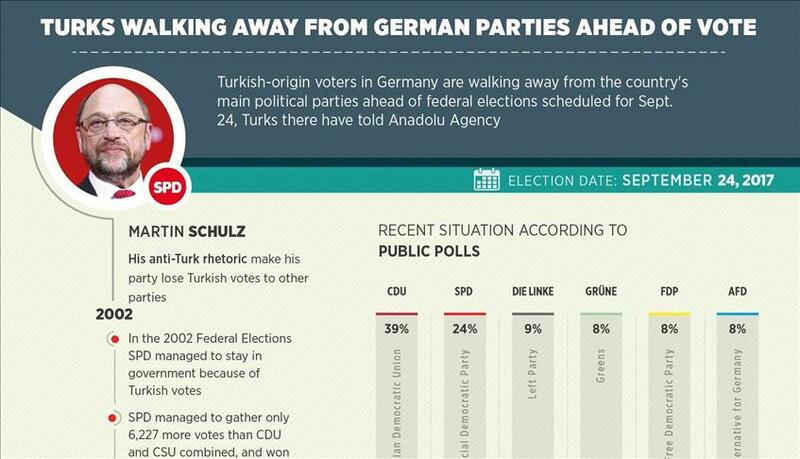 Turkish-origin voters in Germany are walking away from the country’s main political parties ahead of federal elections scheduled for Sept. 24, Turks there have told Anadolu Agency. Turks who had strongly backed Germany’s Social Democratic Party (SPD) for many years are losing trust in the party’s leader, after his remarks against Turkey. Asiye Bilgin, deputy head of the influential conservative Union of European Turkish Democrats (UETD), told Anadolu Agency this week that SPD leader Martin Schulz had begun to deploy a “racist discourse” during the election campaign. “The SPD, so far, was a party advocating the rights of foreigners and disadvantaged groups in society, and for that reason they were getting votes. “As the language of the SPD continues to be used like this, Turks are moving away from the party. The SPD’s policies and its actions are opposed to each other… [It] is worrying for Muslims and Turks,” Bilgin said.